Read our step-by-step proven process for getting your sales emails read and even appreciated by your prospects. Here at Uhuru, we use an approach to emailing prospects that results in both positive replies and an acknowledgment of how good and refreshing it is to receive a cold email like ours. By the time you’ve finished reading, you’ll know and understand the four steps necessary to creating and sending sales emails for your business. Designed by our lead strategist and CEO Peter Lang, these steps will result in prospects letting you know that your sales email was so good, that though they never reply to cold emails, they just couldn’t resist replying to yours. Our goal with this type of prospecting is to provide value to prospects up front and at no obligation. The purpose of this approach is to open the door to a conversation with those prospects that raise their hands in response to your sales email. The first step in the process is to create value upfront. In order to do this, you need to understand your ideal buyer. What businesses are you targeting? Who are the businesses that you’re targeting, and what are their defining characteristics? You’ll want to identify what makes them a good candidate, what makes them a good fit. You can look at characteristics such as industry, size, annual revenue, geographical location, technology. You might want to look into buying signals. Once you understand your ideal buyer, you’ll want to identify and understand your buyer personas. Personas allow you to personalize or target your marketing for different segments of your audience. Whom are you targeting in the business? What questions do they have that they are actively looking to answer? You’ll want to understand the obstacles they face that keep them from achieving their goals. You’ll want to create value that is specific to your prospect. Determine how you can provide value that is specific to your prospect’s business and specific to your target persona. The value that you provide will be slightly different depending on their role and their concerns within the business. This approach works best if the value you’re providing is not generic or one-size-fits-all. You’ll want to weigh what I call the value/obligation ratio. Weigh the upfront value versus the obligation. Remember, our goal is to provide value upfront at no obligation; so that means no obligation to buy anything from you, no obligation to have a conversation with you, no obligation to do business with you in any way. That requires you to consider how much value you offer versus the effort, time, and/or resources it will take your recipient to receive it and understand it. You’ll also want to consider your effort in providing the value. How much effort and time will this value offer require of you to produce and deliver? You’ll want to consider this over and against the opportunity cost. That is to say, what else might you be doing with that time? For example, you might be sending more sales emails than you could otherwise send, or you might be making a greater number of phone calls, but if you’re unable to offer significant value in those calls or in those emails, that’s not a good trade-off. If you’re unable to offer value in your outreach, multiplying the scale of your outreach is nonsense. Don’t just provide the value that you’ve planned to provide for people without their permission who may not value it. This would be presumptuous. It’d be a waste of your time, it’ll be a waste of their time. You’ll have to find a balance that works for you and your business. Still, the priority here is to offer value upfront and at no obligation. The purpose is to provide real value and to open a door to a conversation where you can provide even greater value and insights and begin to determine whether you may be a good fit to do business together. You’ll want to create a list of prospects that you can email and/or call. There are numerous ways to do this, but whatever your means, the list should be generated after having considered and having documented your ideal buyer profile and your buyer personas. It’s best not to email prospects who aren’t likely to be a good fit for your business. While this can happen—and probably will happen—you want to minimize the opportunity for that. Consider using a sales productivity tool during this step. There are many tools available that can make your job easier. We won’t go into detail here on which would be the best fit, but if you’d like to learn more and consider what may be best for you, you can see our article, What Is Outbound Sales. How many touchpoints will be most beneficial? How many days in between touchpoints is most effective? Do you want to include a phone call as a touchpoint within your email cadence? If so, be sure you have a script that you or your sales reps can use so that you can be confident in your communication while remaining natural and sincere. Test, then invest in what works. Track the effectiveness of certain messaging and particular cadences. Experiment and do more of what works. You’ll also want to experiment with your lists. You may have multiple lists that segment your ideal buyers by buyer personas or industry or technology, etc. This may sound obvious, but we talk about providing value and, in order to do this effectively, we need to truly value our prospects, not just when they become leads. But if we value our prospects, we will send messages knowing that there is a human being on the other end of the line whose primary concern is not you hitting your quota. It should not be about how many people are downloading your white paper. If we are wise, we will engage with people by caring about the things they care about, by determining their wants and their goals and helping them attain them. You’ll need to decide what you are asking of your prospect, so determine your ask before contact. Once you have decided what you are asking of your prospect, you’re going to have to determine how to communicate your offer effectively and concisely. The ask in your sales email usually pertains to the effort it takes to receive the value that you’re offering. When creating your ask and determining how to communicate it concisely, don’t get bogged down by thinking that your initial offer of value must be your company’s main offering or the item/service that you ultimately hope to sell to your prospect. Typically, you want to make the ask in your sales email something related to your offering, not your actual offering. Usually, the main offering isn’t as effective in starting a conversation in this way, so use the initial value offered to introduce yourself and open the door to a conversation to learn more about whether you may be a fit to help them with greater things. Also, you may find that you’re not a fit. Again, it would be presumptuous to offer your main offering before learning more about your prospect, determining fit, and determining what their true needs are. Keep your messaging brief. By that, I mean, simply state your ask without fluff or fillers. If you are sending a cold sales email, be polite and kind. Greet your recipient and thank them at the end of the email, but omit pleasantries such as, “I hope you are well.” Too often, pleasantries and even apologies are included in cold sales emails because the sender knows he or she is offering no real value. When you are confident in the value you are offering at no obligation to your recipient, it’s best to simply say hello and state your ask. There will be plenty of time for well-wishing once your recipient has raised their hand and invited you to provide them value. I can hear all of the sales reps cheering in the background. First, be sincere. This is not a bait and switch. It is not a trick to get your prospects on the phone. It is a sincere offer to leave people and businesses better than you found them. It comes with no obligation on the recipient’s part to talk with you or buy your products or services or to do business with you in any way. Don’t apologize for asking for a phone call at this point. While the value offer from your sales email comes at no obligation, now that you have provided real value to a prospect, you would like to have a conversation to learn more about them and to see if there’s an opportunity to do business together. There’s no shame in that. Often, when a recipient replies to your sales email in order to receive the value you offered, it is because they have a need. During your phone conversation, be naturally curious about their current situation. If you’re on an initial call with your prospect and you feel that it’s not going anywhere or you feel that you’re stuck, or for any reason, feel free to ask them why. “You decided to take this call, and I’m curious to know why. What compelled you to take this call today?” The answer will often provide insights as to how you can provide further value and how to best proceed in the sales process. We hope in providing value specific to your prospect, you learned more about their current situation. If you were truly specific in the value that you provided, you can bring this information to the table in your ask for a phone conversation. In doing so, don’t call their baby ugly in order to get a phone call or during any part of the sales process. Compliment them on what they’re doing well on any good you see, but be honest about areas for improvement and the greater value that you can provide them. Again, we want to be aware of the person that we are communicating with. It could be that they get blamed when things aren’t going well and don’t get the credit when things are going well. We want to be sensitive to that in our approach, while at the same time being honest about the value that we can provide and the difference between where they are and where they could be with our help. Don’t jump straight into selling if you should get the phone call. Ask for a conversation to discuss the value you’ve offered. Maybe they have questions about it that you can answer. Make your first conversation another opportunity for you to provide value for them, not just a sales call. Be honest and specific. Each person and company you provide value to will have a different situation, so bring those nuances to the table in expressing why you’d like to have a call. 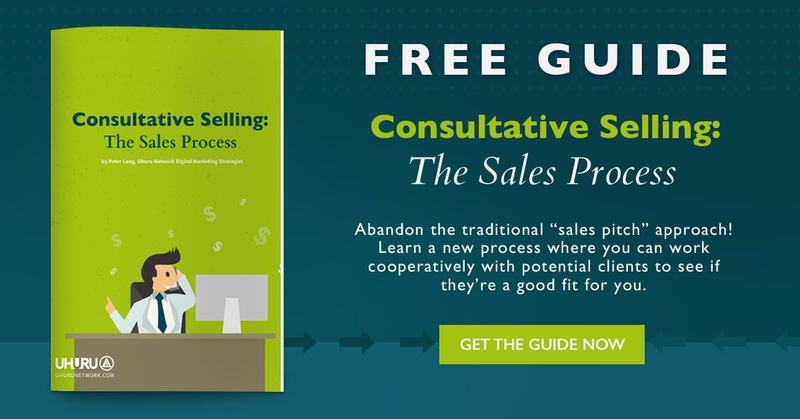 To learn how to carry out a consultative sales approach effectively, see our article here. If you use these four steps to create your sales emails and outbound prospecting efforts, you will see prospects replying because they are compelled to tell you just how good your approach is. More than that, you’ll be able to carry that momentum into your conversations as you continue to establish yourself as a trusted advisor. Your prospects are most likely busy and human nature dictates that anyone opening an email and spotting a wall of text is going to close it almost immediately. If you’re lucky and they’re really interested, they plan to read it later.